Precious metals futures on Thursday traded lower for a second session in a row, driving their weekly losses deeper. Most U.S. markets are closed Friday in observance of Good Friday. Gold for April delivery dipped $2.40, or 0.2%, to end at $1,221.60 an ounce on the Comex division of the New York Mercantile Exchange. The settlement was the lowest since Feb. 26 when prices ended at $1,220.40 an ounce. The yellow metal was pressured as the U.S. dollar saw support, opined analysts. 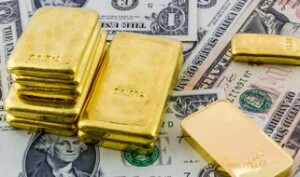 "The dollar is still the most crucial driver for gold," Bloomberg Gold quoted Georgette Boele, a strategist at ABN Amro Group NV in Amsterdam and who expects the metal to climb to $1,370 by year-end. "Short-term sentiment is a bit negative for the metal." Out of 35 market experts contacted, 19 responded, of which only two professionals, or 11%, said they expect to see higher prices next week. At the same time, 12 professionals, or 63%, said they expect to see lower prices, and five analysts, or 26%, are neutral. Market participants include bullion dealers, investment banks, futures traders and technical-chart analysts." Elsewhere, silver for May delivery declined 7.3 cents, or 0.5%, to settle at $15.199 an ounce. The settlement was the lowest since March 3. Silver prices sank 3.9% on the week. They are $1.40, or 10.1%, higher than their final 2015 settlement of $13.80 an ounce. April platinum lost $8.40, or 0.9%, to $952.40 an ounce, falling 1.9% from a week ago. Palladium for June delivery declined $10.45, or 1.8%, to $572.65 an ounce, dropping 3% on the week. For the year to date, platinum and palladium are higher by 6.6% and 1.9%. Gold added $3.40, or 0.3%, to $1,221 an ounce. Silver declined 30 cents, or 1.9%, to $15.28 an ounce. Platinum declined $3, or 0.3%, to $957 an ounce. Palladium declined $3, or 0.5%, to $577 an ounce. For the week, their losses totaled 2.5% for gold, 4.1% for silver, 1.5% for platinum and 2.7% for palladium. United States Mint bullion products registered a daily gain of 3,000 ounces in American Gold Eagles. The U.S. Mint this week limited sales of American Silver Eagles to 1 million. The agency’s bullion distributors ordered 94.3% of them through Thursday. Their cumulative total for the year is 13,942,500 coins, or 23% higher than through the same time in record year 2015.